Peer into Miriam Persi’s freezer and you will be greeted by zip-top bags filled with small, round Iraqi Kurdish dumplings called kubbeh. There are flat spheres filled with meat ready to be plunged into hamusta, a hearty green soup with spinach, Swiss chard, celery, onion, garlic, and enough lemon to make you pucker just the slightest. There’s the round “red kubbeh” ready to be dropped into a crimson soup of tomatoes and beets that’s served over rice. And finally, there are torpedo-shaped kubbeh, filled with beef tinged by a mix of cumin, coriander, allspice, garlic, and paprika, and wrapped in a coat of bulgur. They are destined for the frying pan where they will become crisp and brown, served alongside salads. 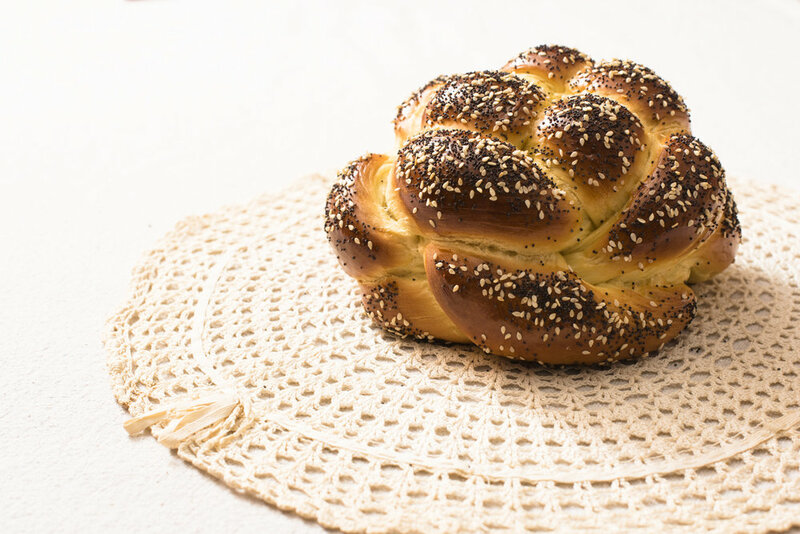 Breakfasts and lunches revolved around tahini, honey, nuts, and dates, but kubbeh was always part of the dinner rotation: Red kubbeh on Tuesdays, fried kubbeh on Fridays, and green for Pesach or special occasions. 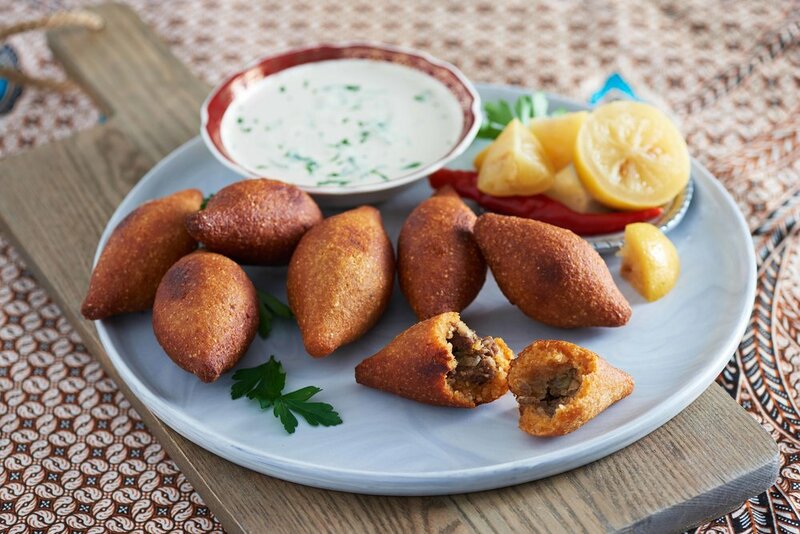 The fried kubbeh are another signature, known in the family as kubbeh ozna’im, or ear kubbeh, a nickname given by her grandson when he was little. 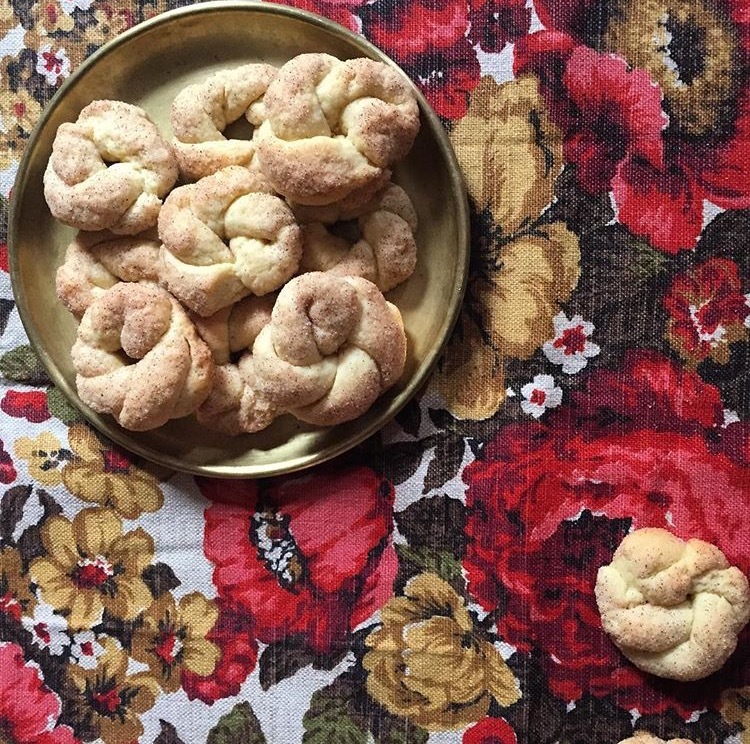 In place of her grandmother’s recipe, Miriam learned this recipe from her husband’s mother, a 6th generation Jerusalemite with Kurdish family roots, who showed her how to form the small torpedo shape. Today, they are always in the freezer, ready to be fried on a special occasion (on shavuot, the meat is traded out for hard boiled eggs and onions) or when a family member requests them. Like many of the best home cooks we know, Miriam doesn’t use measuring cups or spoons in her cooking. To help ensure the recipe reaches generations to come, we captured her recipe with measurements and advice for mastering the dumpling’s classic shape. *Most bulgur that is available in regular supermarkets is #4. What you need for kubbeh is #1. A specialty food store like Kalustyan’s should be able to point you in the right direction. Just let them know that you are looking for the finest grain of bulgur for making kubbeh. 1. In a medium bowl, soak the bulgur in cold water for 30 minutes. Discard the water, rinse the bulgur and leave in the bowl covered with a towel. 2. Heat a medium-sized sauté pan over medium-high heat. Place the ground beef (and ground lamb fat if using) in the pan breaking it up into smaller pieces with a wooden spoon until browned and no longer pink, about 10 minutes. Add the spice mix, coriander, salt and pepper, and mix well. Turn the heat to low and continue cooking, stirring occasionally, until it looks dried up, about 30 minutes. 3. Meanwhile, heat the ½ cup oil in a pan on medium-low heat, and add the chopped onions. Caramelize the onions, stirring occasionally, until the onions are golden but not darkened, about 20-25 minutes. 4. Add the onions to the meat and stir well, allowing them to cook together for 2-3 minutes. Taste and adjust the seasoning if necessary. 5. Transfer the meat to a colander placed in the sink or over a bowl and let the excess oil drain while cooling, at least 10 minutes. Cool completely before using (either at least half an hour in the freezer but preferably a few hours in the fridge, and up to all night). 6. To make the dough: add the chickpea flour, semolina flour, bread crumbs, oil, tomato paste and salt to the bulgur. Mix and knead with your hands, until a dough forms. If the dough does not come together, start adding water one tablespoon at a time (and up to a ½ cup). If the dough is too sticky add a small amount of flour or breadcrumbs. The dough should neither be wet or sticky, but it should feel like it can hold together, and hold a filling. 7. Set out a large baking sheet. With moist hands, take a ping pong ball sized piece of dough in the palm of one hand and with the other thumb, start to hollow out the ball in the center, gently enlarging it, and keeping a thin layer on the bottom and sides. Fill with 2 teaspoons of the meat mixture - it should be packed tightly and full almost to the top. Gently close the dough (wetting your hands again if needed) and tighten the dough all around it, while shaping it into a pointed football-like shape between your hands. Place the kubbeh on the tray and repeat with the remaining dough and filling. 8. Pour oil into a large heavy-bottomed high-walled pot until it measures 2 inches up the side of the pot. Heat the oil over medium-high heat to 350°F or until bubbles come out from the sides of a wooden spoon when you place it in the hot oil. 9. Carefully place the prepared kubbeh into the hot oil in batches, being careful not to overcrowd. Fry the kubbeh until it is dark brown, turning once in the middle, about 10 minutes. Move to a plate lined with paper towels and continue with the next batch, adjusting the heat as you go to be sure that the oil does not get too hot. 10. Serve immediately, with Tahini or like Miriam serves it - with homemade hummus and chopped preserved lemons. Make ahead: Since the recipe is time consuming, Miriam usually divides it into a few stages. She makes the filling and the dough on one evening, and places it in the fridge until the next day. The next evening is dedicated to shaping the kubbeh and freezing it - first on a tray and then transferring to a zip-top bag. Usually she has a few different kinds of kubbeh in the freezer (both for frying and for soup), and when she has guests, she drops them straight from the freezer into the hot oil, adding 2-3 more minutes to the frying.